Today’s technology presents unprecedented migration incorporating a wide range of application requirements such as database, transaction processing, data warehousing, integrated audio/video, real-time computing, and collaborative projects. 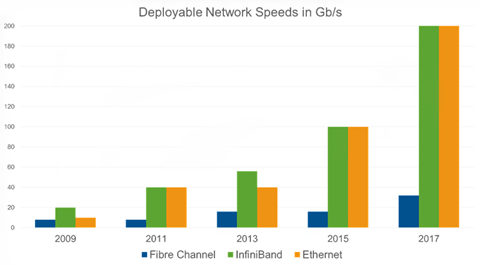 Fibre Channel and Gigabit Ethernet, both are the ideal solutions for IT professionals who need reliable, cost-effective information storage and delivery at fast speeds. Fibre Channel is available in 1G/2G/4G/8G/16G FC and 10GFCoE, 40GFCoE and 100GFCoE nowadays. 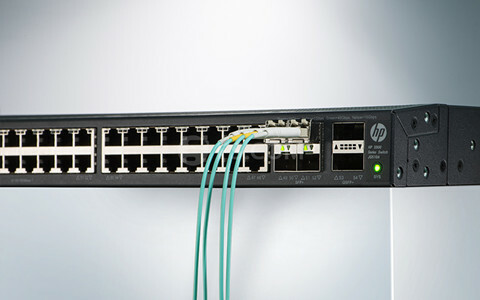 Gigabit Ethernet is the reigning network for data center and server room. The battle between Fibre Channel and Ethernet is complicated. However, this article will help you solve it out by comparing 10G SFP+ Fibre Channel transceiver modules and 10G Ethernet SFP+ modules. Any time we’re transmitting or storing data, we encode it in some form or another. Then we need to understand the encoding mechanisms of Ethernet and FC. 1, 2, 4, and 8 Gb Fibre Channel all use 8b/10b encoding. Meaning, 8 bits of data gets encoded into 10 bits of transmitted information, the two bits are used for data integrity. For example, Original 1Gb FC is actually 1.0625Gb/s, and each generation has kept this standard and multiplied it. 8Gb FC would be 8×1.0625, or actual bandwidth of 8.5Gb/s. 8.5*.80 = 6.8. 6.8Gb of usable bandwidth on an 8Gb FC link. 10GE (and 10G FC, for that matter) uses 64b/66b encoding. For a 10Gb link using 64b/66b encoding, that leaves 96.96% of the bandwidth for user data, or 9.7Gb/s. 10G SFP+ Fibre Channel (FC) transceiver, as the name implies, is the 10G optical transceivers used for Fibre Channel applications. 10G FC SFP+ module has the same footprint as SFP form factor and is compliant with MSA SFF-8431. 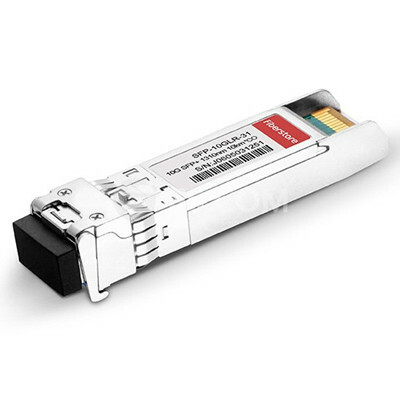 10G SFP+ Fibre Channel transceivers uses the either the 850nm VCSEL as the transmitter fro multimode fiber or 1310nm/1550nm laser as the transmitters for single-mode fibers in SONET OC-192 /SDH, 10GBASE-SW, 10GBASE-LW, 10GBASE-EW, and 10GBASE-ZW applications. Cisco DS-SFP-FC10G-LW, seen in the above image, is the long-range single-mode 10G SFP+ FC optical module for a link length of 10km over 1310nm wavelength. 10GFC is backward compatible with previous generation 8G/4G/2GFC and will auto-negotiate down to the fastest speed supported by both ports. This allows 10GFC devices and switches to be seamlessly integrated into expansion segments of existing FC networks without a forklift upgrade. SFP+ 10G modules is the optical transceiver for serial optical communication applications at 10Gbps. Unlike the SFP+ FC transceivers, 10GBASE SFP+ Ethernet modules can use either copper or fiber cabling. SFP+ 10GBASE-T optical transceiver supports Cat6 RJ45 copper cables for a link length of 30m. 10GBASE SFP+ Ethernet modules are available in several 10 Gigabit Ethernet standards like 10GBASE-SR Ethernet, 10GBASE-LR, 10GBASE-LRM, 10GBASE-ER, 10GBASE-ZR, and 10GBASE-T.
Cisco SFP-10G-LR is the 10km Cisco 10GBASE-LR SFP+ module that uses 1310nm as the transmitter type over single-mode fiber cables. 10GBASE-LR SFP+ modules cannot be auto-negotiate with 1000BASE SFP transceivers, but for most switches, SFP+ ports can support 1G SFP modules for 1Gbps data rate. From the previous description, we can easily draw a conclusion that 10G Fiber Channel SFP+ and 10G Ethernet SFP+ share several specification in common. They have the same form factor as 1000BASE SFP transceiver modules. Except the application, 10G Fiber Channel SFP+ SW module and 10Gb SR SFP+ transceivers have the very similar functions with each other. For the exact information, please see the following table. 10G Fiber Channel SFP+ is used in 10G Fibre Channel, yet 10G Ethernet SFP+ is utilized in 10G Ethernet networks. Without denying, Ethernet is the dominating network for every data center and server room. The “old” Ethernet network—1Gb/s and 10Gb/s speeds relied heavily on TCP to deliver data, which was reliable but somewhat unpredictable. However, today’s Ethernet runs at 25, 40, 50, or 100Gb/s speeds, is no longer dependent on TCP alone. It also supports RDMA connections which lower latency and frees up CPU cycles to run applications. 100Gb/s technology is quite matured in 2017 and there are many relevant devices available on the market, such as CFP/QSFP28 optical transceivers, 100G switches and network interface cards, 24 fiber MTP cables, etc. Meanwhile, FC is still transitioning to 16/32 Gb/s technology (32Gb/s is not mature), which is quite slower than what Ethernet was supporting several years ago. For 32Gb/s FC network, it still supports only block storage traffic. Other storage (and other non-storage) traffic will require an Ethernet network anyway. If we look at what is coming in 2017, the battle will not be 10/40/100GbE Vs. 8/10/16/32Gb FC. Almost everyone would agree that it would be nice to have a single network for all traffic, and very few users want a new protocol and the challenges of changing the way that they do things. FC or Ethernet, which is best for storage? 10Gb FC SFP+ has the same usable bandwidth as the 10Gb Ethernet SFP+, and without the overhead of FCoE, but you don’t get the consolidation benefits of using the same physical link for your storage and traditional Ethernet traffic. FS.COM offers reliable 10G SFP+ transceivers in Ethernet, FC, BiDi, CWDM/DWDM applications. If you are interested in our products, please contact us directly.